With 2016 coming to a close, I wondered what design trends might be in store for 2017. Being a previous design student, a lifetime ago, one thing I learned was to pay close attention to commercial trends. because two years after commercial trends begin the trends wander in to interiors. Pantone choses the colors, and each year release the color of the year, usually one year in advance. The new color trends enter the fashion world first, then interiors. The reason for Pantone? In order for manufacturers to create everything you'll need to coordinates with the new colors; shoes, bags, scarves, rugs, towels, linens, they must have time to manufacture the goods. Pantone is that lead. 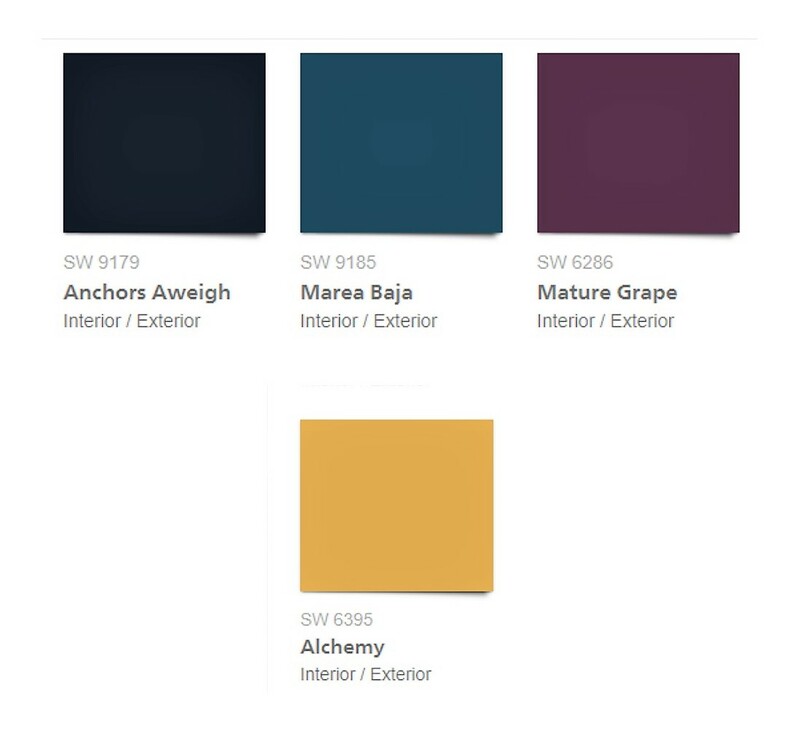 Commercial formats have the first indication of the color trends to come. In the past few years I've noticed brown, taupe, rust, wine, and the revival of dark green automobiles. As trends catch hold the colors become more prevalent. I couldn't help thinking, we were returning to jewel tones soon. What would that transition look like? The 2017 Mercedes AMG G63 SUV wear "Jade Green Metallic". Trends tend to cycle in ten year intervals. We've been neutral for that time period. During a trend period changes are subtle; accent colors, metals, variation of style. For example designers will introduce modern art in a seemingly traditional space, or begin to use flea market finds. When one trend fades away, the replacement is something clearly different. I wondered how the next trend would appear, blowing in like a gale force wind, or quiet transition? Well, hold on to your hats friends, here come the jewel tones...again. Sherwin Williams 2017 Noir color collection includes "Anchors Aweigh" a rich navy, "Marea Baja" an intense peacock blue, "Mature Grape" a deep eggplant purple, and "Alchemy" a golden yellow with a hint of green undertones. You may view all the 2017 Noir color collection here . 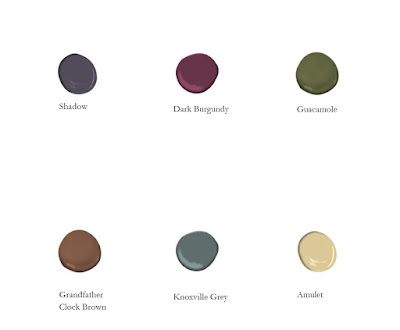 Benjamin Moore 2017 color pallet includes jewel tones; "Shadow" a stunning deep black purple, "Dark Burgundy" a merlot shade, "Guacamole" an intense avocado shade, "Knoxville Grey" a soft blue green based grey, "Amulet" a soft wheat shade, and "Grandfather Clock Brown a soft warm brown. You may view all the 2017 colors here . 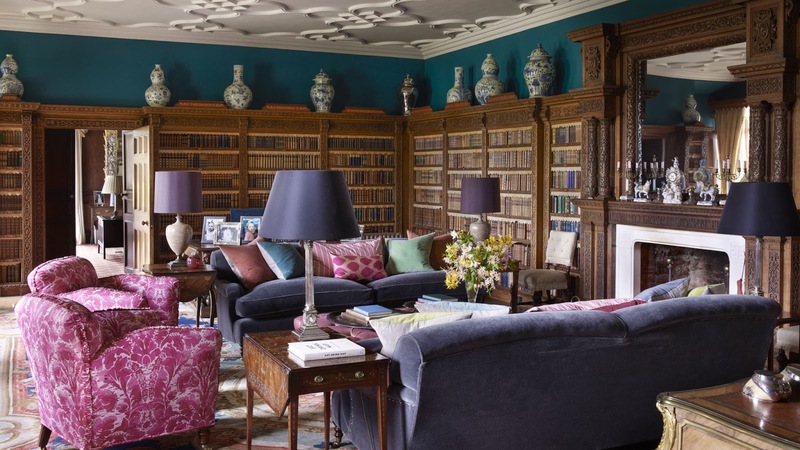 Elle Décor featured an English country home this month; Somerleyton Hall. You may read the entire story here. 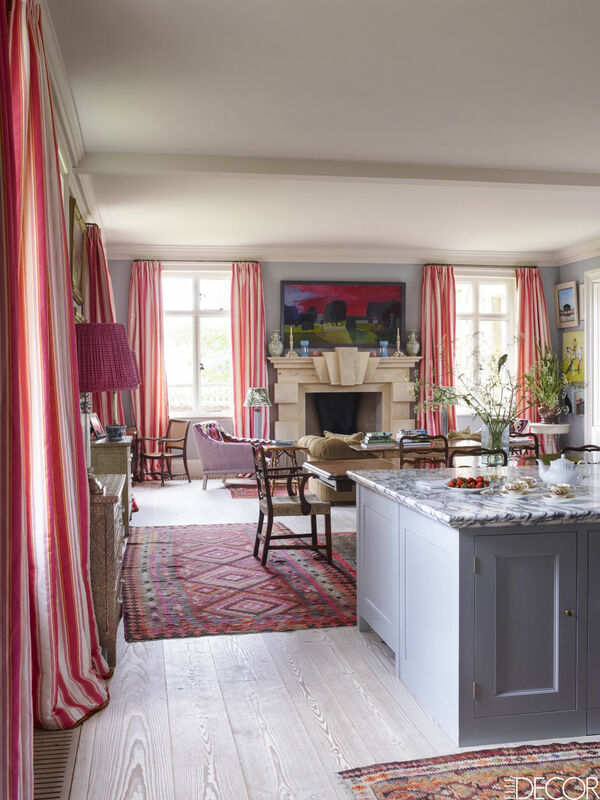 Interior designer Laura Ingrams worked with the owners, Lara and Hugh Crossley of the historical property to restore it while adding a fresh new face to reflect the young family who call it home. The family allows public tours in a portion of the house, taking care to preserve the history, and architectural details of the home. The spaces seen by the public are more traditional. The colors are most certainly jewel tone, rich blues, and purple accented with grey dress the public library. Traditional in style; blue and white porcelain, a French antique desk, a stunning velvet sofa, and antique rug anchors the space. The club chairs covered in Bennison Lorenzo fabric feature contemporary lines and a traditional fabric. Notice the pillows on the sofa; layers of jewel tones anchor a geometric modern pillow taking center stage. The private spaces feature bright color trends; drapes made from Bennison "Pavilion Stripe"; pink, orange, and oyster stripe on linen, paired with cool grey walls and cabinetry, antique rugs, and contemporary art, create a layered space. 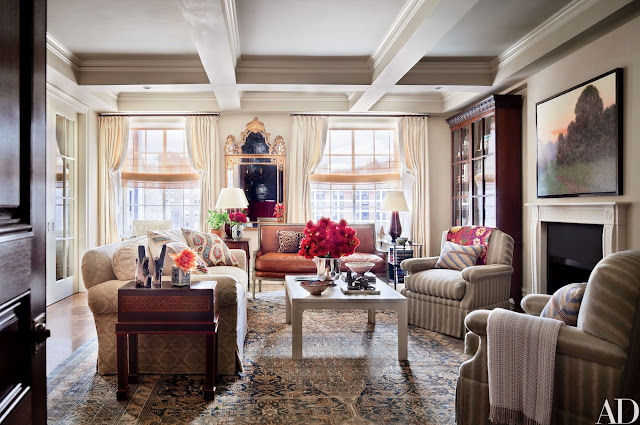 The room is sensitive to the history of the home, while being as young and vibrant as the family who calls it home. 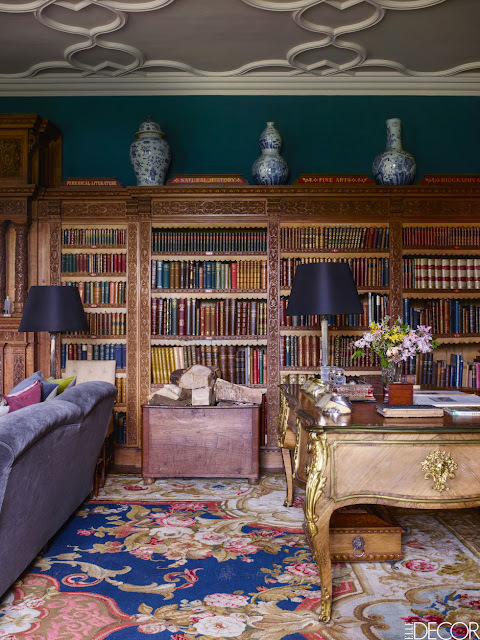 The "Crimson Room", features Colefax and Fowlers silver silk, lined in ticking by Ian Macking. 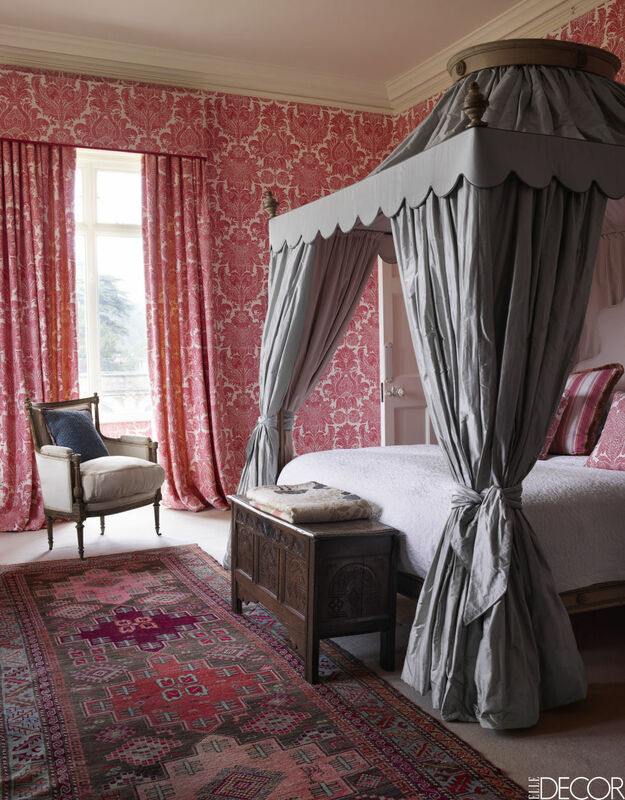 The walls are dressed in another Bennison fabric featuring a stunning large medallion pattern, "Lorenzo" again in pink. Again we see a layering of textures; traditional pattern upon the wall in a trendy color, a magnificent antique bed dressed in a combination of silk and pillow ticking, paired with a white quilt prevents the room from becoming stuffy. Imagine the same bed dressed in velvet. An antique rugs grounds the space, and pulls the color scheme together. I think many designers will continue upon the trend of an eclectic mix; traditional, modern, mid-century, blended with vibrant colors and patterns. For the trendsetters, this style will be Chic, and all the rage. This trend isn't for everyone. It appears a bit chaotic to some of us; a mix of textures, colors, and styles it can be a bit overwhelming. Although, I must say it is never boring. 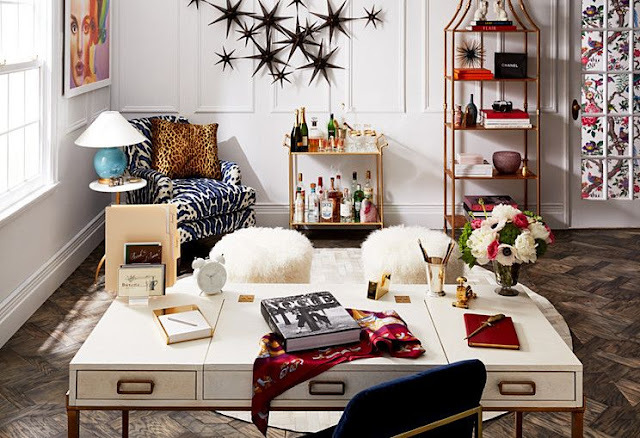 Studying the layering of each room you'll find an interesting use of elements; below a 1970's Chinoiserie desk is paired with a similar style étagère, furry stools at center, a blue and white club chair sporting a leopard print faux fur pillow, a blue slick glass ginger jar lamp dresses the modern side table, a collection of rustic stars are the focal point of the back wall, set atop traditional picture molding while earthy wood parquet flooring grounds the space, and traditional toile wallpaper are seen through the French door. For some this room excites, for others, they don't know where to look. Here, in America over the past three years we've experience our own phenomena; Chip and Joanna Gaines. 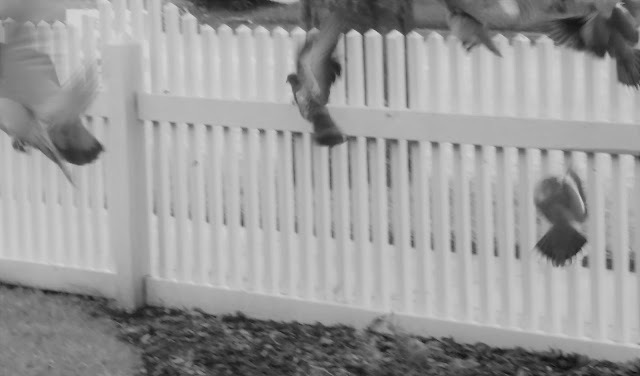 The HGTV trendsetting pair have created a very specific style; vintage, farm and ranch style. The duo certainly have affected the Interior Design world. In a way that I believe may have left most designers a bit confused. Joanna is a marketing major, she's is not a designer. Her relaxed farm ranch, collected look lends itself well to families and can be accomplished on a budget. We all know how important affordability in design is. Her style allows the average person to have a creative, personalized space without taking out a loan. 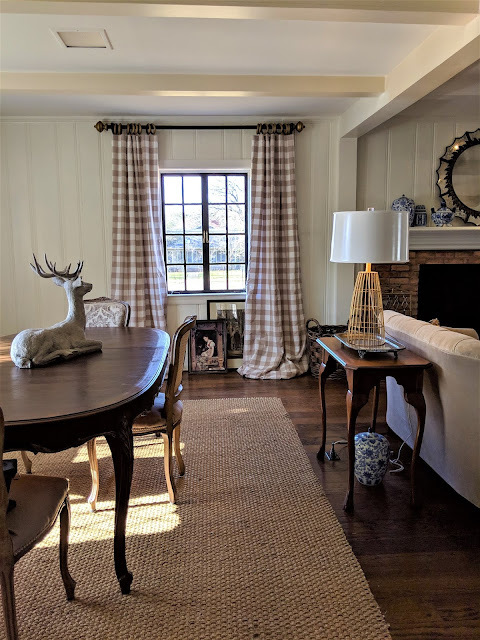 Each space she creates reflects the homeowner to an extend; whether its using an antique bike as art above the desk of a family of cycling enthusiast, or using a poem written by a father for the groom and bride as a focal point in a room, she personalizes each space she designs. I think her influence, and the trend of farm ranch casual style will continue for at least the next three to five years. I believe the style is going to evolve, as trends do, subtle with small changes in an effort to keep it innovative and fresh. I believe there will more color, and cream linen will make way for leather and jewel tones as seen below is this space created by Joanna Gaines for the HGTV show, "Fixer Upper; Old World Style". 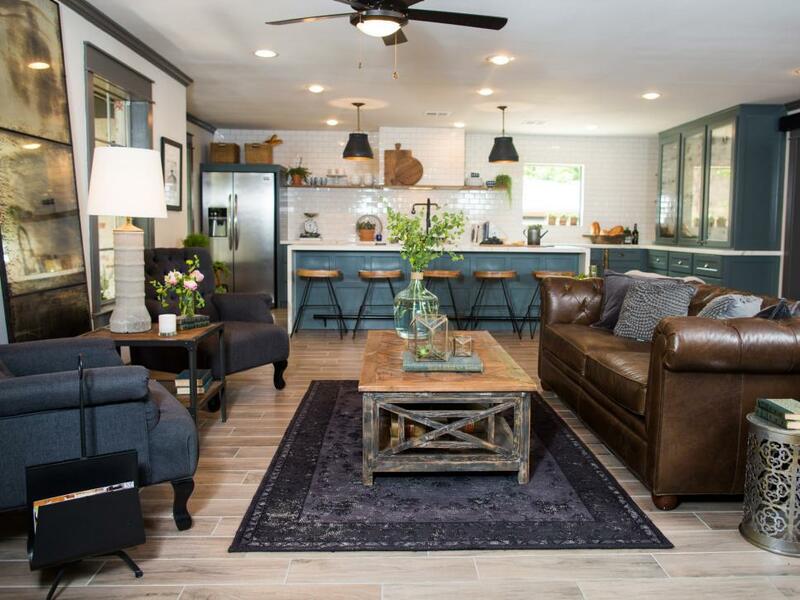 Photo credit HGTV Fixer Upper "Old World Style"
With the darker jewel tones, we can expect to see warmer colored fabrics, and I predict more textured fabrics as well; flannel, wool, velvet and leather will most likely come back. With leather's return, an over all more masculine feel may slowly arrive upon the scene, as a direct opposite to the past trend of feminine white linen. There seems to be a subtle reference to earthy colors, with that. it would make sense to see a return to natural elements in our homes; terracotta, slate, warm wood, and hand made ceramic tiles. With the return of jewel tones we can expect rich patina brass accents to wander back around, rather than the shiny gold brass of 2016. I think in addition to brass, we may see forged iron enjoy a come back. The room below featured in Architectural Digest last month, designed by famed Michael Smith for Ali Wentworth and George Stephanopoulos; features a warm color pallet, antiques paired with more casual upholstered pieces, a stunning French mirror is a focal point between the windows, a natural landscape graces the fireplace wall, and an antique traditional Asian rug anchors the space. The room is layered, collected. Kitchens I believe are going to change a great deal, colored, and stained cabinetry, free standing rather than built-in feel. 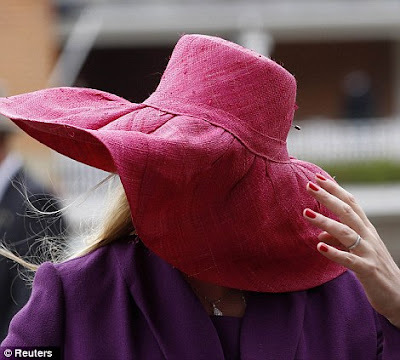 I believe layering is going to grow popular again, think English country style. Rooms will begin to have a travelled, and collected, worn, a historical and lived-in feel once again, romantic and rustic. Slipping away in the next few years will be all white interiors, white sofas, white slip covers, and sparse rooms. Sleek, chrome, nickel, and stainless will begin to fade. The Hollywood Glam trend will dim. 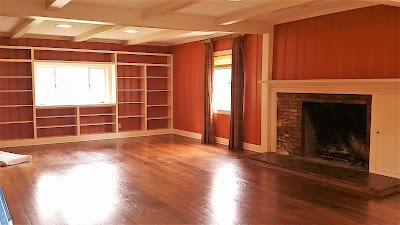 Light floors will give way rich warm wood tones, and crisp linen will give way to soft comfortable colorful fabrics. I fear Carrera marble will no longer be chic, although Carrera is a timeless element, and looks great with jewel tones as well as neutrals. White subways, and glass tiles will probably become a bit passé as well. 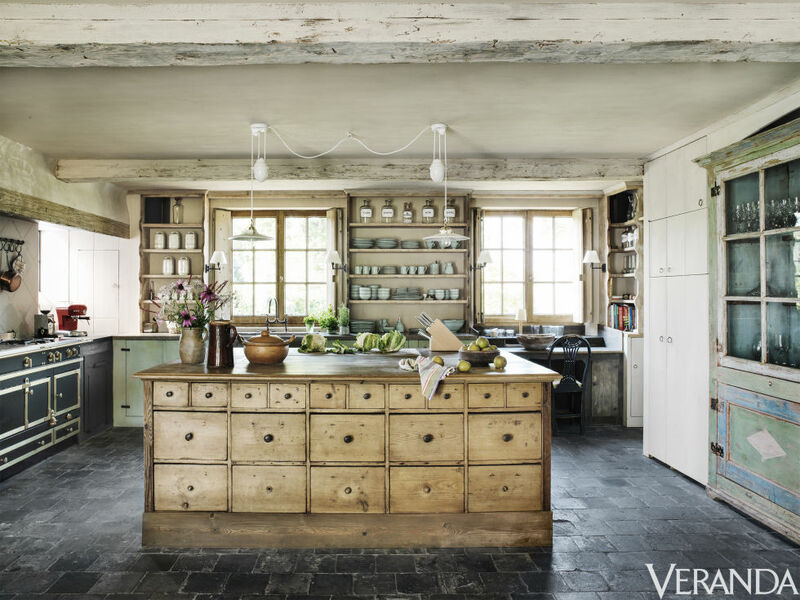 I truly fear that white cabinetry will be replaced with colorful painted or stained cabinetry. 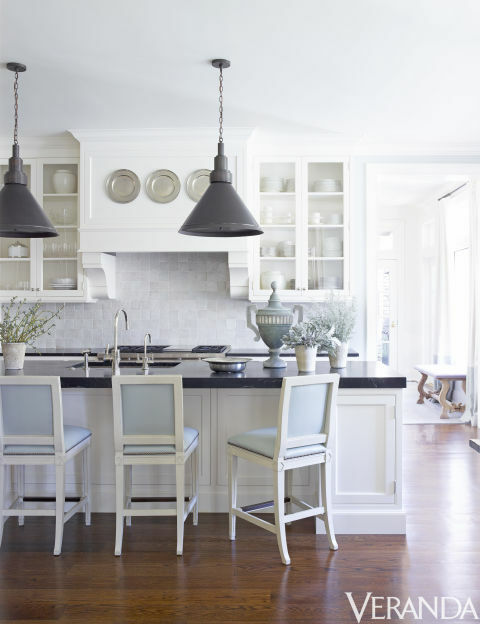 Although white cabinets are bit like a "little black dress", they are timeless in the right space. Whatever 2017 holds for the interior design world, I'm certain we are standing upon the brink of something new. I'm looking forward to the journey into the future, sharing my thoughts with you, and hearing your thoughts as well.